For the last fifty years, legends have been made by depicting life in New York: Woody Allen, Spike Lee, Neil Simon, Jerry Seinfeld, and Chris Rock to name just a few. Concurrently, we have been treated to a score of great novels about New York including Tom Wolfe’s Bonfire of the Vanities, Don Delillo’s Underworld and Fallen Man, James Baldwin’s Another Country, and Jay McInerney’s Bright Lights, Big City. By now, Manahattan must be the most thoroughly explored place on this planet. Are there any new stories left? Apparently so. Annie Roiphe’s Art and Madness takes us on a disjointed tour through Manhattan’s Bohemian underbelly in the 1950s and 60s. 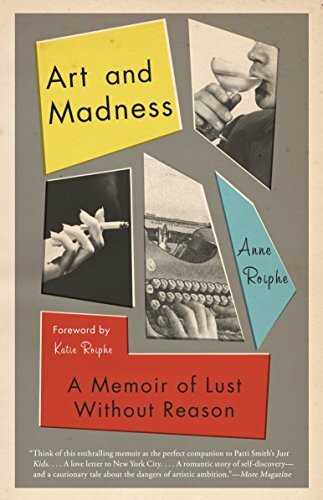 The book lurches out of sequence through Ms. Roiphe’s life as she documents her excesses: sexual promiscuity, fondness of drink, radical politics, and flawed parenting. Yet despite a desire to deconstruct her worst moments, the book is neither depressing nor self-pitying. Ms. Roiphe has a fine way of narrating failure, playing Jane Goodall to the saddest moments in her life. A case in point is the way Ms. Roiphe treats celebrity encounters in Art and Madness. While running in Manhattan’s artsy circles, Ms. Roiphe crosses paths with her share of the famous and the near-famous. Mia Farrow, Jason Robards, Lauren Bacall, Salvatore Dali, Roy Cohn, Edward Albee, George Plimpton, William Styron, and Norman Mailer all make appearances in Art and Madness. Ms. Roiphe offers a nonchalant anecdote for each of them (i.e., Mailer’s drunken fist fight, a one-night stand with Plimpton) and then moves on. A lesser memoirist would have dwelled on the celebrity encounters. And Ms. Roiphe explains promiscuity this way: “There exists an entire universe between virginity and promiscuity… Moderation for most of us is a most unnatural condition . . . In moderation’s wake follows kindness and safety, calm and thoughtfulness. Also it can be dull, droning dull.” But some of these asides are oft repeated (i.e., the same criticism of suburban life is offered five times). In some ways, Art and Madness is quirky. For example, Roiphe offers no roadmap as the book hopscotches her life. Authors are not obligated to offer chronological narrative, and many books are well served by out of sequence narrative (i.e., Slaughterhouse Five). But the “unstuck in time” nature of Art and Madness confused this reader—without chronology, it was hard to keep track of all the people who come and go. Also, Ms. Roiphe refers to her daughter only as “the child” when all other characters in the book are meticulously identified by name. The decision to leave her daughter unnamed is curious considering her repeated insistence that she was a loving mother. Even so, Art and Madness is a very worthwhile read. For fans of hardboiled New York memoirs like Pete Hamil’s A Drinking Life, Ms. Roiphe’s Bohemian Manhattan is a wonderful foil. Both books half-celebrate and half-excoriate boozing it up in Manhattan in the early 60s, but from blue vs. white collar perspectives. Fans of the wonderful TV series, “Mad Men,” will see the same creative, drunken people in Art and Madness; however, this time those people are seen through the eyes of a Jewish girl who is permitted to sleep with these pampered, brilliant men, but never allowed to meet “mum” at the country club. Art and Madness is not a perfect book, but it educates without preaching, and illuminates without blinding. As demonstrated in previous books, such as the excellent novel, Up the Sandbox, Ms. Roiphe is comfortable simultaneously educating and entertaining. Above all, Art and Madness proves that even in Manhattan, the most narrative-saturated place on Earth, there remain fresh and insightful stories.